The national struggle to lower healthcare costs is ongoing and the Centers for Medicare and Medicaid Services is doing its part to address the contributing factor of unnecessary admissions to the hospital. It’s happening far too often with the elderly when a nursing home doesn’t feel it has the staff to handle medical problems and there is the ever present fear of litigation. 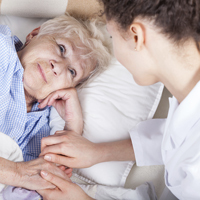 Other concerns arise when a resident’s health deteriorates rapidly and their physician cannot be immediately reached. Various reasons put elderly residents in the hospital for observation even when the concern is relatively minor. In an attempt to reduce the number of unnecessary hospital visits, Medicare has started to penalize hospitals with high rates of readmissions. Some hospitals are pushing back by refusing to release nursing home residents back to facilities with a high incidence of resident readmissions. To understand the importance of resolving these issues check out, “How can we keep nursing home residents out of hospitals?” The Forbes article examines the potential savings with a more efficient system in place.